This is the shocking moment a barmaid attacked a woman for slapping her posterior in a crowded bar. The video shows the spectator enter the bar and interrupt the shot-pouring barmaid mid-routine during a tradition involving cinnamon whisky being poured down a punter's throat. Footage of the altercation, which took place in Spirits on Bourbon in New Orleans, was posted to Twitter last week and has since gathered nearly 10 million views. 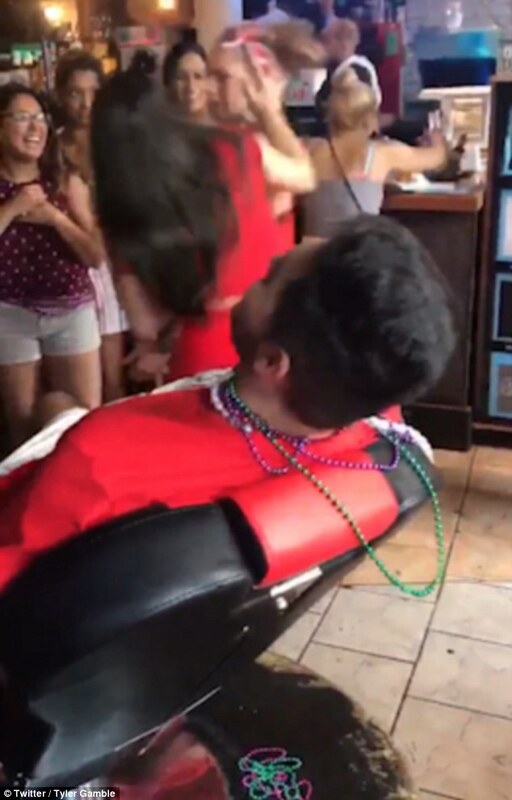 During the video, the barmaid in red latex trousers, a red T-shirt and sunglasses is pouring alcohol into the male recipient's mouth when the other woman approaches her. The punched woman, who looks at the barmaid in a state of shock, is then ushered out of the bar by the bouncer who intervenes and the waitress returns to the man in the chair for her routine. 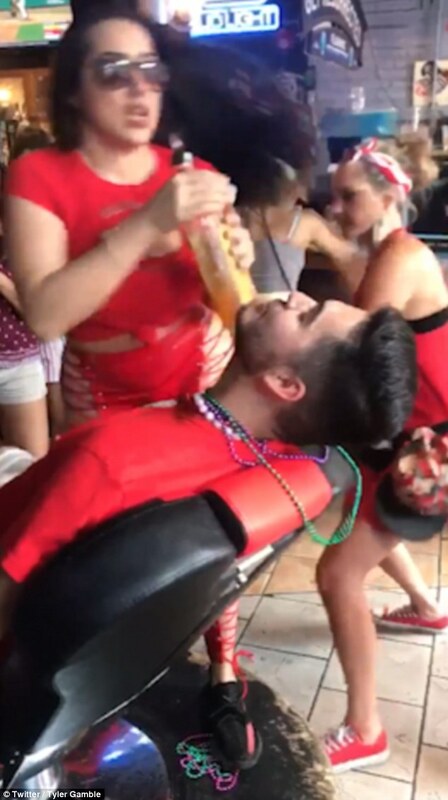 The strange tradition at the american bar involves a routine whereby a punter is slapped intermittently in a revolving barber chair while liquor is poured in their mouth and breasts are rubbed in their face. The man in the chair, believed to Tyler Gamble, looks on at the assault from his chair. Spirits on Bourbon say the chair belonged to former owner Edward DeBoire, who tragically died at 33 after the 'free flowing drinks and beautiful Creole ladies' called to him and the chair is now used to pay homage to him. Their website reads: 'It is said that his spirit enjoys our bar. 'In fact, what is now our stage was where his barber chair stood. 'It was clear when the stage was erected that Edward did not appreciate having his barber chair removed.